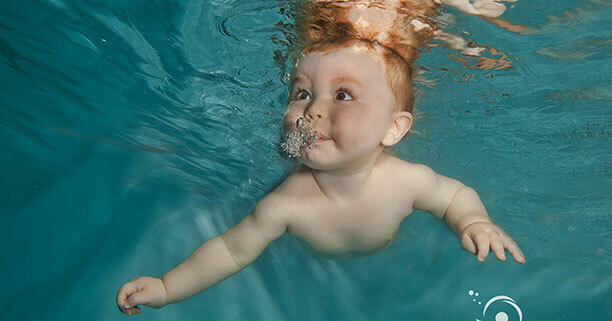 Our baby-led swimming approach ensures your little one grows in confidence and develops an early love of the water. Your little one will acquire swimming and safety skills in a fun, gentle and reassuring environment. We include relaxed submersions, where we gently build on a baby’s natural reflex to hold their breath and your little one will soon be amazing you by swimming short distances underwater. Whilst teaching your baby an essential life saving skill, our lessons are also great fun! It is a great bonding experience with your child and many of our parents say it is the highlight of their week. We run much smaller group classes than our competitors, so that everyone receives plenty of individual attention. Each session lasts for 30 minutes. Our baby swim lessons cost £10 per a class and are payable a school term in advance. Please see our Baby FAQ section for any further questions you may have.